17 Marlborough is located on the north side of Marlborough, between Arlington and Berkeley, with 15 Marlborough to the east and 19 Marlborough to the west. 17 Marlborough was built ca. 1865 by wholesale dry good merchant George Howe. He and his wife, Susan Boylston (Walker) Howe, lived at 36 Beacon and had 17 Marlborough built as the home of their son and daughter-in-law, George Dudley Howe and Alice Lloyd (Greenwood) Howe. George Dudley Howe was a dry goods merchant in his father’s firm. The land on which 17 Marlborough was built was part of a larger tract of land originally purchased from the Commonwealth of Massachusetts on November 6, 1858, by George Goss. He and his partner, Norman Carmine Munson, were the contractors responsible for filling the Commonwealth’s Back Bay lands. The original tract ran from where 9 Marlborough would be built west to Berkeley Street. On the same day he purchased the land, George Goss subdivided in into smaller parcels and sold them to several different buyers, many of whom then resold them to others. George Howe purchased the land for 17 Marlborough on March 1, 1864, from Harriet (Upham) Putnam, the wife of merchant John Pickering Putnam. Harriet Putnam had purchased the lot on January 17, 1863, from Ebenezer Rockwood Hoar, part of a parcel he had purchased from George Goss. Ebenezer Hoar was an attorney and associate justice of the Massachusetts Supreme Judicial Court and later would serve as US Attorney General in the administration of President Ulysses S. Grant. He and his wife, Caroline D. (Brooks) Hoar, lived in Concord. Click here for an index to the deeds for 17 Marlborough. 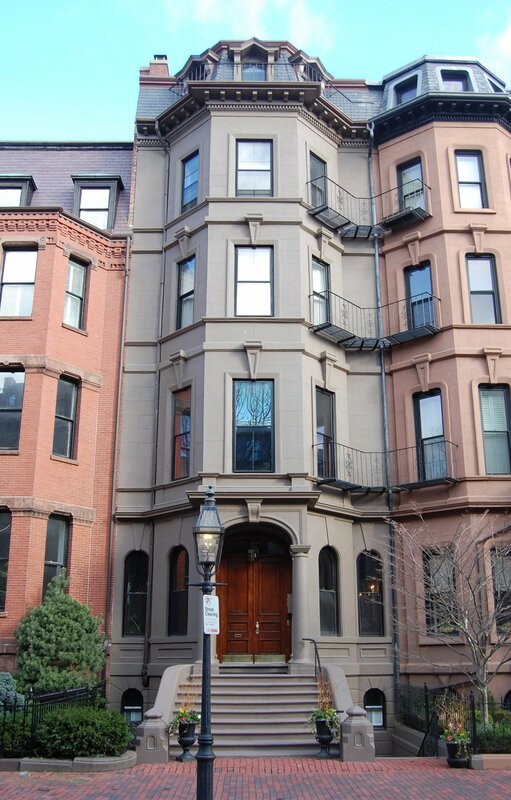 While 17 Marlborough was being built, George Dudley Howe and Alice Howe lived temporarily across the street, at 32 Marlborough, which had been J. Pickering and Harriet Putnam’s Boston home. The Howes previously had lived at 17 Temple Place. A house of a similar design across the street, at 16 Marlborough, built by John Mixer in 1865, had been challenged by its neighbors as being in violation of the building restrictions contained in the deeds originally granted by the Commonwealth of Massachusetts. In March of 1869 the Supreme Judicial Court had ordered that it be rebuilt. George Howe probably was concerned that 17 Marlborough might face a similar challenge. The house to the east, at 15 Marlborough, had been built before 17 Marlborough; the owner had lodged no complaint and, with the passage of time, was precluded from doing so. However, no house had been built at 19 Marlborough and a new owner could challenge the design of 17 Marlborough. In addition, as was occasionally the case, the western party wall of 17 Marlborough may not have been built precisely so that half of the wall rested on each side of the boundary line between the two lots, as required by the party wall agreement entered into on April 30, 1864, between George Howe and Isaac Spring, who owned the lot to the west at that time. George Howe died in December of 1871. In his will, he left 17 Marlborough to George Dudley Howe. In 1878, George and Alice Howe built a home, The Cliffs, in Manchester, the first residence designed by architect Arthur Little. They continued to live at 17 Marlborough during the 1884-1885 winter season, but then made Manchester their primary residence. During the 1885-1886 winter season, 17 Marlborough was the home of Caroline (Sturgis) Tappan, the wife of William Aspinwall Tappan. Her primary residence was at their home, Tanglewood, in Lenox. By the 1886-1887 season, she had moved to 147 Beacon (303 Berkeley). On July 3, 1886, 17 Marlborough was purchased from George Howe by furnace and range dealer Cyrus Carpenter. He and his wife, Rebecca (King) Carpenter, made it their home. Rebecca Carpenter died in September of 1890 and Cyrus Carpenter married again, in October of 1891, to Mrs. Ellena E. (Green) Fuller, the former wife of Dean Fuller. She was a vocalist. Cyrus Carpenter died in April of 1893, struck and killed by a horse car at the corner of Arlington and Boylston. In his will, he specified that his widow could continue to live at 17 Marlborough for a “reasonably convenient period not exceeding four months” after which it was to be sold for the benefit of his heirs. On September 27, 1893, 17 Marlborough was purchased from the estate of Cyrus Carpenter by Miss Bridget Brady. It became the home of her sister, Mary Ellen Brady, a dressmaker, who operated it as lodging house. Among the lodgers at 17 Marlborough was Dr. George Gray Sears, a physician, who lived and maintained his office there from about 1894 through about 1897, when he moved next door to 19 Marlborough. In about 1897, Mary Brady married Victor W. Belanger. He was an editor, founder of Le Courrier de Worcester. and an inventor, credited for developing a rotating coil for spinning cotton. After their marriage, the Belangers lived in Marshfield and also continued to operate the lodging house at 17 Marlborough. By 1901, Victor and Mary Belanger were living at 17 Marlborough once again, and continued to operate it as a lodging house. The Belangers continued to live there until about 1906. On April 16, 1906, 17 Marlborough was purchased from Bridget Brady by Samuel Gelston King. He and his wife, Alice Tyler (Clarke) King, made it their home. They previously had lived at 476 Commonwealth. They also maintained a home in Nahant. Samuel King was a wholesale chemical and paint dealer. In April of 1917, Samuel King applied for (and subsequently received) permission to add a one story, 6 foot by 9 foot addition at the rear of the building. The addition was designed by architect William Whitney Lewis. Alice King died in May of 1926. Samuel King continued to live at 17 Marlborough until his death in December of 1932. The house remained the property of the King family, who leased it to others. By 1934, 17 Marlborough was the home of Frederick Allen Marsden, a retired physician, who operated it as lodging house. He had lived in an apartment at 405 Marlborough in 1933. By 1935, he had moved to 22 Marlborough. By 1935, 17 Marlborough was the home of Ethel (Northrup) Whalen, the widow of Theodore H. Whalen, who continued to operate it as a lodging house. She was a former nurse and previously had lived at 267 Newbury. On March 15, 1946, Ethel Whalen purchased 17 Marlborough from the King family. She continued to live and operate a lodging house there until about 1948. On March 2, 1948, 17 Marlborough was purchased from Ethel Whalen by Porter Sylvester Elliott and his wife, Teresa Avia (Theresa Avio) (Verplast) Elliott, who continued to operate it as a lodging house. They previously had lived in Bangor, Maine, where he had been a policeman. On March 8, 1949, 17 Marlborough was acquired from the Elliotts by Grant Gordon Dwyer and his wife, Betty Jane (Maynard) Dwyer. He was a purchasing agent with John Hancock Insurance, she was an artist. 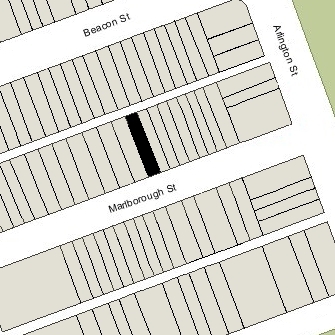 They lived in an apartment at 6 Marlborough and by 1950 had moved to 128 Marlborough. On March 8, 1950, 17 Marlborough was acquired from the Dwyers by Cortland Ainsworth Mathers, an attorney, and his wife, Carolyn Mary (Campbell) Mathers. They previously had lived at 48 Charles. They continued to operate the property as a lodging house. On August 1, 1952, they transferred the property to his father, Lawrence (Laurence) R. Mathers, of Newton. On June 9, 1953, 17 Marlborough was acquired from Laurence Mathers by J. Douglas Oliver. He previously had lived in Watertown. On July 21, 1954, 17 Marlborough was acquired from J. Douglas Oliver by Edythe Gertrude (George) Dawson, the widow of Abraham Dawson. She previously had lived in Florida and Melrose. She continued to operate 17 Marlborough as a lodging house. She lived at 17 Marlborough until about 1959, when she moved to Melrose. On January 12, 1959, 17 Marlborough was acquired from Edythe Dawson by Daniel J. Kelley and his wife, Mary M. Kelley. They continued to operate it as a lodging house. On May 21, 1975, they sold the house to Francis P. Kelley and his wife, Elizabeth A. Kelley. In November of 1979. Francis Kelley applied for (and subsequently received) permission to convert the property into six apartments. On February 11, 1980, the 17 Marlborough Realty Corporation purchased 17 Marlborough from Francis and Elizabeth Kelley. 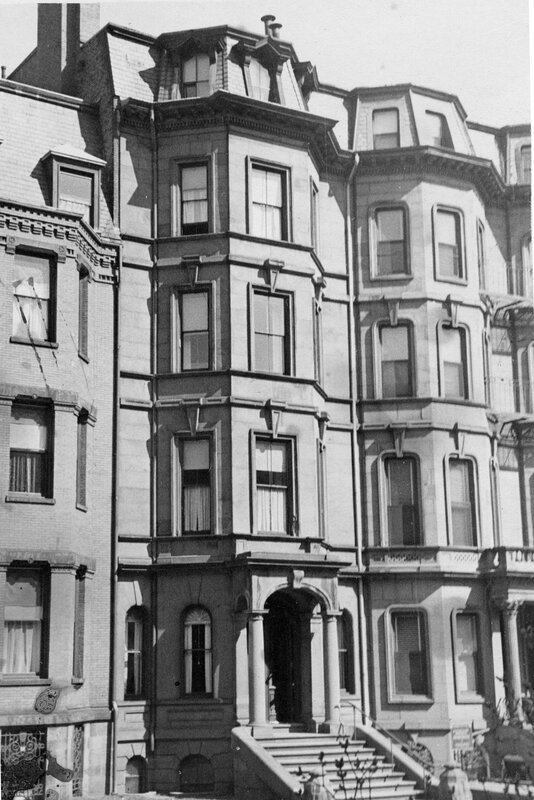 On July 18, 1980, it converted the house into six condominium units, the 17 Marlborough Condominium.